This brand new professional hub-style extra large Ground Hunting Blind Tent with zero detection is ideal for hunting. 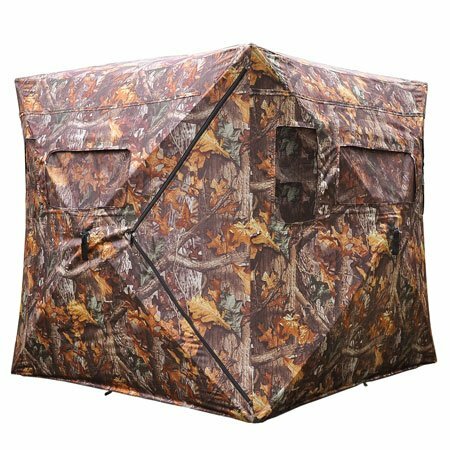 With high-quality glass fibre frame, weatherproof poly featuring autumn wood camo, large zippered roof window, 4 full view windows and 7 small windows with mesh camo, our ground hunting blind tent can help you to conceal for viewing and shooting. Can be set up and folded easily in minutes. With autumn wood and leaf camo, excellent to conceal for viewing and hunting. Durable glass fibre frame and heavy 300D polyester fibre for windproof and water-proof. With a large zippered corner door. 4 full view windows with removable camo mesh. 7 zippered small windows with removable slotted camo mesh for easy shooting. 2 convenient camo storage pockets inside the tent. Black-out interior with bottomless design. 8 ground stakes and 4 tie down ropes to fix this hunting blind tent stably. Come with a portable carrying case with easy carrying belt and small camo storage pocket. Durable steel wire frame and heavy 300D polyester fibre for windproof and water-proof.